In the Puget Sound Region, it’s clear that climate change impacts will involve changes in precipitation that will impact agriculture, especially agriculture in floodplain areas (Mauger et al. 2015). However, it’s not yet known how precipitation pattern changes will combine with changes in stormwater run-off and sea-level rise… and how these changes might differ between different watersheds. Flood risk reduction folks want this information so that they know how to properly size new culverts. Fish folks want this information to place and design salmon habitat restoration projects. Nancy’s Ditch, a key agricultural ditch in the Puyallup Watershed’s Clear Creek area, is consistently slow-flowing and full of water. Photo: J. Jobe. But, it turns out that this information will also dramatically impact what to do about agricultural drainage, a current challenge. Getting surface water off of fields early enough to plant spring crops can be tricky, and often the fall rains saturate fields before farmers can plant winter cover crops. Farmers need to know what to expect from precipitation changes in the future so that they can adapt to those changes. Crop selection, cover crop timing, and maintained agricultural drainage infrastructure will be critical for future agricultural viability, as much or more than it is today. So, it is important that farmers also understand and have the ability to use climate change information. In the Puyallup Watershed, floodplains host a diverse array of farms and agricultural businesses that benefit from the rich floodplain soils. They also are under pressure of development, suffer frequent flooding, and provide inadequate fish habitat. Recognizing the conflicting pressures, the Floodplains for the Future Partnership of 22 partner organizations are working to support the recovery of floodplain functions. The key is to achieve that by balancing farm, fish, and flood interests and needs. The Partnership’s Farm Committee has taken the lead role in understanding, researching, and advocating for agricultural viability in Pierce County so that the agricultural community’s needs are met whenever possible by this multiple-benefit effort. Since 2015, their efforts have focused on the Farming in the Floodplain Project (now affiliated with the Center for Sustaining Agriculture and Natural Resources), working to identify agricultural viability needs and support actions that could improve the ability of farmers to successfully farm in Pierce County. 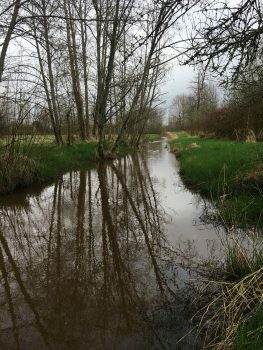 The first three years of this work led to some not-terribly-surprising conclusions and next steps for Pierce County: agricultural drainage, often the biggest physical barrier to agricultural viability, has been inadequately maintained for decades, and now is worsening flood risk (Environmental Science Associates 2017). In addition, as our Partnership works to improve agricultural drainage (at a landscape scale, as well as through policy), we’ve recognized that there are serious gaps in our understanding of how to address future agricultural drainage needs, because these will change with a changing climate. We are not alone in this. As we wrestled with the best way to get robust data around future precipitation changes and sea level rise, we realized that our counterparts working on the flood and fish habitat side of things—the other two legs in this integrated management stool—needed very similar data to understand things like what vegetation to use in restoration efforts, and how tall to construct levees. We were all using different reports, baseline data, and models to understand how our shared landscape might be impacted by climate change… so how likely were we to find solutions that work for farms, fish and flood? In order to meet the need for solid, relevant, and specific climate change data, we decided to collaborate, pool resources, and design a shared approach. We have partnered with the University of Washington’s Climate Impacts Group to collate available data, determine what we should use as shared baselines, identify data gaps, and define a path forward to collaboratively develop new models for the Puyallup Watershed. 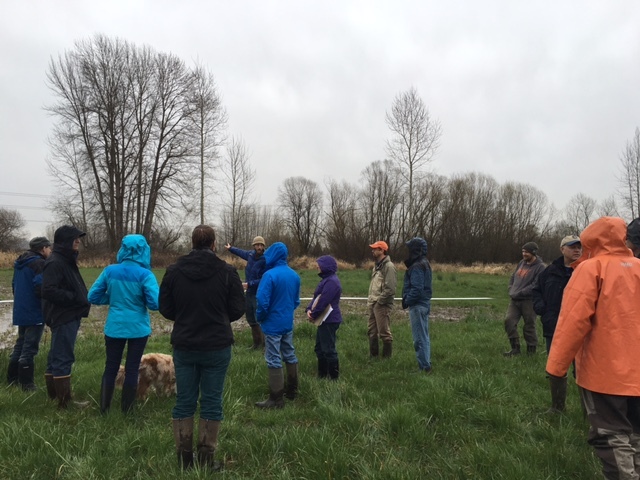 Farm, Fish, and Flood folks meet on a farm in the Puyallup Watershed to better understand how this farmer successfully farms with the existing high groundwater levels and agricultural drainage systems. This approach is unique, but logical: collaboration will lead to a greater understanding of the specific predicted changes for our Watershed, it allows us to pool our resources (time and money) and we will create better-quality models with a higher degree of buy-in from the many partners involved in this work. Working collaboratively, the Floodplains for the Future Partnership’s shared development of climate change data will allow us to continue to build trust between interests that sometimes are at odds—between agricultural landowners and the County, between fish biologists and farmers. We will have a clearer idea of how precipitation changes may impact the land use decisions that face our Partnership. By the end of 2019, this work will have taken shape: we’ll have a shared path forward to fill in the critical gaps for climate change data needs to inform better decisions for farm, fish, and flood-focused efforts. Environmental Science Associates. 2017. Final Drainage Inventory Memorandum. Memo prepared for the Farming in the Floodplain Project and PCC Farmland Trust. Accessed Nov. 28, 2018. Also published on the Perspectives on Sustainability blog at the WSU Center for Sustaining Agriculture & Natural Resources and the Agricultural Climate Net blog.